On February 7, prolific Mac accessory maker Twelve South announced the HoverBar ($80) - an extendable arm that connects an iPad 2 with a table, iMac, Apple display, and more. I naturally ordered one, and it arrived today. Here are my initial impressions. The HoverBar arrives in Twelve South’s distinctive and sturdy boxing. As usual, they recommend awesome ways to stay green and re-use the package, including re-purposing it as a photo box, gift box, or pen holder. 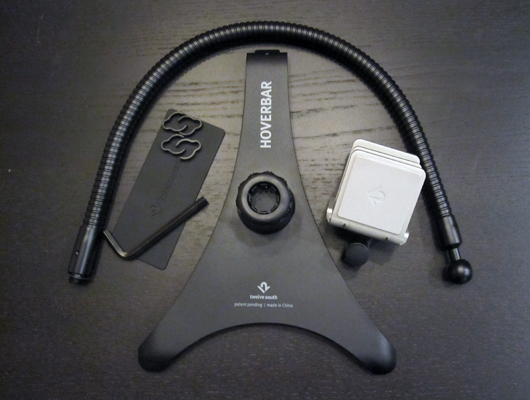 The HoverBar includes the following: a flexible arm with a washer, a two-way mounting clip, a hex key, a silicon pad, optional cable clips, and an iPad display clip with collar. Assembly is straightforward. If attaching to an iMac or monitor, you connect the arm into the straight side of the mounting clip. Anything else requires screwing the arm into the 90-degree opening. The silicon pad is included to assist in tightening the arm. The display clip is then affixed to the ball-tip of the arm and tightened with the collar. Next, the clamp is mounted to the desired item - in my case, an Apple display - and tightened using the hex key. Finally, the iPad pops into the display. The arm is then adjusted until your iPad is in the desired position. Below is what mine looked like when finished. The HoverBar’s parts are high quality, which one would expect given the price. Assembly was a breeze. However, there were issues when it came to mounting and adjusting the HoverBar. The arm is very stiff and can be difficult to manipulate. Making matters worse is the connection of the arm with the mounting clip. The two are simply screwed into one another. No matter how tight the connection appears, it would often come loose when I adjusted the arm. This would result in an iPad folding down toward the desk. Frankly, I let a few curse words fly in disgust. In my opinion, the connection should have included a locking mechanism. Once the iPad was in the desired location, the mount was generally sturdy. In one case, I used the iPad to test an app in development while coding on the Mac. This was extremely useful and, in my opinion, represents the best use-case. I also had the iPad display a journal article while writing a manuscript. This was also useful, although reaching up to swipe became rather cumbersome. I had the same experience when using the iPad for normal tasks, such as checking email, Twitter, or a web page. While the mount was sturdy, there was a certain amount of bounce in the iPad when touched. I suppose this is inevitable with an arm attachment, but either way I found it slightly annoying. In general, frequently reaching up to the device inhibited my workflow. Another potential issue is that the display clip only works on a naked iPad. That means you must remove any case prior to use. If you have a folio, or any other tight-fitting case, this can prove burdensome. 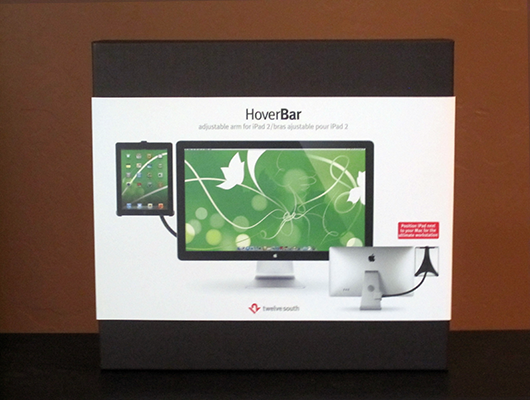 In my opinion, the HoverBar is best used as a passive display. Examples might include app development, research, or having a calendar open. However, in cases where you frequently interact with the iPad, the HoverBar doesn’t quite deliver. My arm became slightly fatigued, the iPad wobbled, and I found myself distracted from the desktop environment. 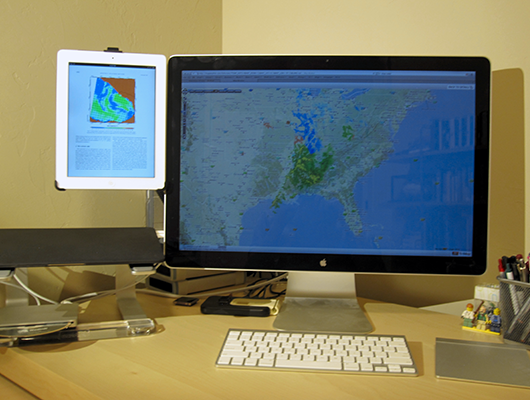 It was quite obvious why Apple has avoided a touchscreen iMac. If you like the look of the iPad side-mounted to a display, intend to use it as a passive screen, and don’t mind removing your case, the HoverBar is a great solution. Otherwise, I would advise against purchasing because cheaper options exist for similar functionality. I will likely return the HoverBar and stick with the Twelve South BookArc. While having a high-quality industrial design, the HoverBar’s benefits weren’t worth $80.